IT IS HERE! SNATCHER IS NOW FULLY PLAYABLE IN ENGLISH! Well... after a long time I had translated this marvelous game to portuguese. The portuguese translation is almost finished and I had started to work on the scripts to other languages translation also. A long time has passed since the first person tried to translate this game. Many of them had quit because of the difficulties inherent to the game internals. Many misteries grown based on the "untranslateability" of this game... Well, the game itself is now translated, and I'm enhancing many of it's functions. Hey, don't get me wrong. The translation work was not easy. It was something like "eating rocks instead of cake"... Hehehe. Anyway, every dificulty was solved and it looks like no serious side effects surfaced. The portuguese translated game uses the same resources needed by the original version provided by Martos: 128Kb of memory mapper and a normal SCC (Satcher and SD-Snatcher SCC+ will also work, full featured, of course!). English one require some more memory. Look for requirements on the readme! Beside Martos (mapper version) and Dante Nishida (translation of the graphics), I would like to thank several users that helped with the translation, such as Artemio Urbina of Junker HQ, who had dumped the game texts by the first time and Takamichi Suzukawa, the guy that had spent many hours of it's life translating the japanese text into english... I would like to thank Ricardo Bittencourt, because he created and modified the BrMSX emulator, adding functions needed by me and Dante during the translation (Hey! Waht about addind the missing V9958 functions and finish the Shalom translation!?). Norikuni Kofuji, who gave me an original Snatcher game, including booklet and disks. Artemio Urbina, who deservers a HUGE THANKS by the help and support during the translation and specially for the gift he sent me: a SD-Snatcher game including everything (the SCC+ too! ), booklet and 90 cards of Snatcher colection...! Simple installer and readme added. The game will use extra memory pages for more than 13.5kb of text again. Now it can have about 1MB of extra text. Disk 0 Loader is ready. It is integrated with HardDisk loader, so only one .COM is needed. Code updated to the same level as english version. Some more corrections to the scripts..
A tela de escolha de opções inicial. "Esta é uma história de ficção. com a realidade é mera coincidência." lutam neste mundo repleto de traição." 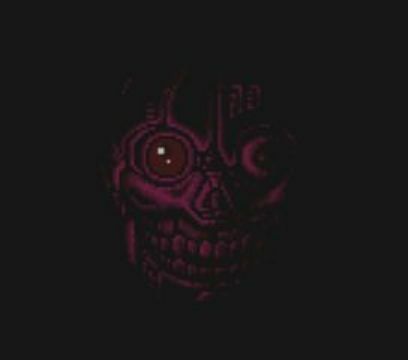 Snatcher, o logo do jogo utilizado até os dias de hoje pela Konami. A tela de registro de nome, com o nome "Fudeba" sendo entrado. "Começar a investigação com este nome?" "Moscou, 6 de Junho de 1991"
O 'Centro de Pesquisa Chernotron' misteriosamente explodiu. desenvolvida, escapou então para a atmosfera. Uma grave ameaça à vida estava livre." ...metade da população mundial pereceu. foi mais tarde denominado: 'A Catastrofe'." "A humanidade enfrenta um perigo anormal. Uma misteriosa forma de vida emergente, os bioroids. Uma nova arma de alguma nação? Ou invasores alienígenas de outro mundo?" tomam sua forma, se infiltrando gradualmente na sociedade. Sua pele artificial pode suar e até mesmo sangrar. É praticamente impossível distinguí-los do original." O logotipo da versão MSX. "'Gilian Seed'. Cerca de 31 anos. 17a. Equipe de Sobrevivência na 'Zona Neutra Siberiana'. mistério. Está vivendo separado de Jamie há 2 anos. 'JUNKER' na cidade de Neo Kobe." "Insira o Disco 2 e pressione espaco..."
Atendente: "Você está no JUNKER HQ. O que deseja?" Mika: "Sr. Gilian Seed? Desculpe não ter notado. nome é Mika Slayton. Muito Prazer!" Mika: "Onde devo te levar primeiro?" Mika: "Chefe, o Sr. Gilian Seed está aqui." Chefe: "Bom que veio, Gilian Seed. Sou o chefe do JUNKER HQ, Benson Cunningham." Gilian: "Sou Gilian Seed. Sou do 17o. Esquadrão Especial." Mika: "Esta é a sala de investigação dos runners. Gilian, a sua escrivaninha é aquela ao fundo." Gilian: "Que tal essa aqui?" Mika: "É do Jean. ... de 'Jean Jacques Gibson'." tiro para melhorar nossa mira." Harry: "Muito prazer. Então Gilian Seed é você. (SR e superiores)'. Estou encantado..."
Gilian: "Metal Gear? Nome estranho..."
Harry: "Sim... Mas não é uma arma laser militar. grande resistência à variação de temperatura. Snatcher, na Fábrica em Ruínas, setor M! velocidades, at´ mesmo na perpendicular." You are the visitor #00100455 to view this page!